At least 14 people, mostly students, were killed when a bus taking them on a camping trip was involved in a horrific crash. The collision was so severe the roof of the bus was almost completely ripped off. About 45 other passengers were injured, many critically, said Darlito Bati, a disaster response officer in Tanay town in Rizal province east of Manila. Ten victims died at the scene, while four others have since succumbed to their injuries. The dead include the driver and a teacher. Mr Bati, who helped pull victims from the wreckage, said many of the dead were piled in a heap of bodies at the front of the passenger cabin. “The students were having fun along the way because the camp at a resort was to last for three days,” Mr Bati told The Associated Press. The students of Bustling College, Quezon city, were mostly taking computer courses. They were less than 30 minutes from their destination at the Sacramento Adventure Camp when the crash occurred. Some of the survivors reported smelling burning rubber before the tragedy occurred. Garbage truck driver Danny Gutierrez, who helped the victims into ambulances, said some of the survivors wept, while others were too shocked to speak. 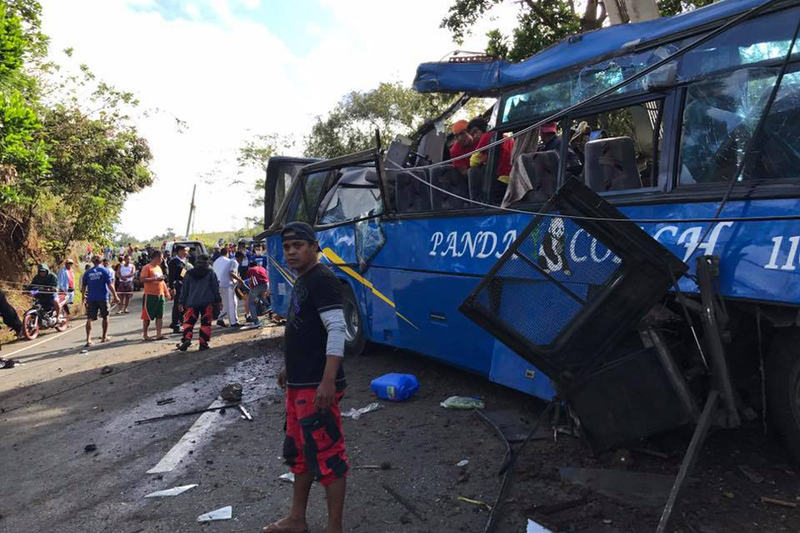 Berlin Flores, of the Tanay Municipal Disaster Risk Reduction and Management Office, said the Panda Coach bus carrying the victims was the last of nine travelling in convoy. Mr Flores said authorities were now closely monitoring the injured passengers, who were taken to the 2nd Infantry Division Army Station Hospital, Tanay General Hospital and Rizal Provincial Hospital.